A round-up of the latest books by local authors. It’s a good idea to write about something you know well, and Cofton Hackett-raised Nigel should know a thing or two about political intrigue and smoking. He’s fought and lost a parliamentary seat in Edgbaston for the Tories and been selected to fight another, in Halesowen, before being forced out by Conservative head office over a newspaper column. And when I worked with him he could fill an office with fag smoke in no time. His first novel arrived just as were going to press, so there was only time to read the first chapter, which rocked along in what I remember to be typical Hastilow fashion as a total smoking ban is imposed on Britain and an MP is stitched up. If you’re the sort of person who loves to soak up trivia, this book is the ideal stocking filler – even more so if you’re a native of Brum or its environs. Crammed with an inordinate amount of facts about the Second City, it’s also a genuinely useful resource for history buffs and researchers. Presented in a list format, there is information on the tallest structures, highest points, shortest bicycle lanes and most-congested highways, as well as facts about Birmingham’s famous sons and daughters – and of course, a guide to Brummie words and phrases. There are reports of royal visits, criminal offences and some unintentionally hilarious entries from old school records, as well as such essential titbits as the names of the three female otters at the Sealife Centre! 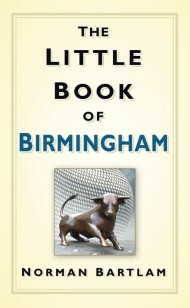 The Little Book of Birmingham is published by The History Press, £9.99. Alvechurch bell-ringer and chartered surveyor Greg Hunt, from Barnt Green, has just published his first novel, set in South America, the Alps and Portsmouth. Archie Malcolm is a student, working for the Navy and looking for love. He’s also a bell-ringer at the local cathedral. When he’s tasked with reducing the rise in illegal substances entering the UK, he embarks on a journey that takes him to the Alps. The mission brings him closer to home than he could ever imagine and brings him into conflict with former friends and those he loves. Will Archie discover the truth behind the corruption on his doorstep and bring down those responsible? Will his friends save him or be his downfall? The Ringer is a fast-paced action novel with a gripping plot and an ingenious bell-ringing story thread. Inspired by authors such as Dan Brown and Jeffrey Archer, it will be enjoyed by fans of action adventure novels. The book is available from http://www.troubador.co.uk or from the author on 07860 937469. Hail, Salubrious Spot!, former Barnt Green resident Gavin Bantock’s account of his village childhood, proved so popular that a second print run has now been commissioned.